Girlfriend’s grip on the souvenir ball she’s been juggling tightens. “That’s just fine with me!” she says in a not-so-fine tone and she turns abruptly to face Boyfriend’s prize possession. “You know what? That TV has always looked rather cumbersome in that corner.” she says as she throws her best pitch ever. We are each a work in progress; self-derogation is time wasted. I tell them to be proud of their willingness to grow and improve. EMPLOYEE VALUES are not to be confused with Employee Motivation! Most supervisors understand what motivates their employees – the tangible and intangible rewards and incentives that keep them productive (and for those that don’t, stay tuned because we’ll discuss that another time). EMPLOYEE VALUES are extremely important, yet rarely considered, let alone discussed! And since they are not separate from the workplace, they must be respected. 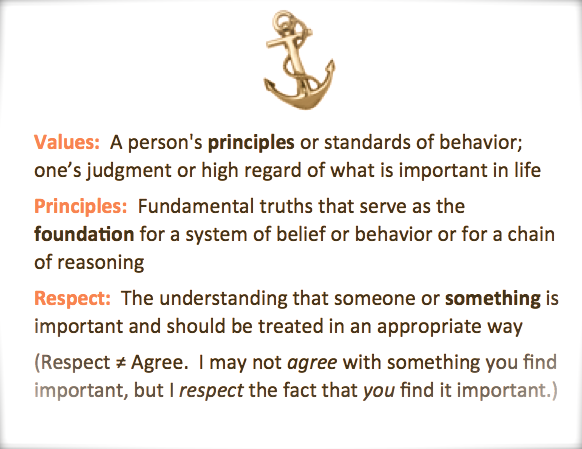 In the workplace, discussions about VALUES are typically limited to the ones established by the organization; the guiding principles that help to define how the organization behaves. “Commitment to sustainability… Environmentally friendly… Safety is a top priority,” are common company values and you’ve probably seen them on your company’s website or a wall in the cafeteria. (Supervisors, it benefits you greatly to know those values too, but I’ll explain that in a future post). My point for now is, the average employee associates the word VALUES to the company, yet rarely think about their own values. Is it really your business to know what your employees value? The exercise I use answers that question. I provide over a dozen different visuals that represent values (education, family, health, etc.). Through a ranking process, participants eventually stand face-to-face with their top three values. Some find the process excruciating, like I’m asking them to cut off their own hand! (That reaction alone proves the significance of values in our lives!) Some are quick to determine their top three values. Some are surprised to see how their values have changed through the years. Regardless, when the exercise is complete, all participants are acutely aware of their top three current values, but more importantly, they see the diversity of ranking order amongst the rest of the group. For some, Family-Love-Health are the top three. For others, Adventure ranks very high, or Finances, or Community. In other words, very few people rank their personal values in the same order. How does this apply to supervising? If “Family” is one of your top three values, you will most likely favor those employees who feel the same. Hypothetical example: Two of your employees request a personal day next Friday, but you can only approve one request. You know that Employee A wants to attend their child’s karate ceremony, while Employee B has an annual golf outing with friends. Because “Family” is a top priority to you, you will most likely approve the request of Employee A. You may even mock Employee B and tell him to do that kind of thing on his own time! (That’s discrimination of values and it’s based on your personal opinion of what’s important and what’s not important). Sara broke down in tears during the break, “You nailed the problem I have with my supervisor!” Friends are a top priority to Sara who has no family; she even lost her son to an untimely death. Her supervisor seems to favor the five other employees who value family as much as he does. What I find most interesting is that on average, 9 out of 10 of the participants have NEVER even thought about this before. They admit they rarely considered their own values when committing to a job or relationship. Could that account for the high rate of divorce and dissatisfaction in the workplace? Do you tend to judge those who don’t value the same things that you do? You can change your perspective easily by allowing others to talk about their own values. (That’s a great opener for your next safety meeting!) And always consider placing a high value on BUILDING TRUST. Johnny Supervisor is a platform dedicated to strengthening the weakest (yet most important) link in the chain of command — through developing superior supervisors who are committed to the company’s smooth succession. Follow Johnny for articles, resources and recent trends in healthy succession at the supervisory level. By the way, Johnny travels well! DISCLAIMER: Johnny is a fictitious character who emerged while training thousands of employees in different organizations. Johnny represents males AND females in a variety of industries. Copyright © 2015. Johnny Supervisor. All rights reserved. This entry was posted on April 10, 2015 by Lynette Landing in Empower and Motivate, Trust Building, Uncategorized and tagged discriminate, discrimination, employees, lead, manage, principles, respect, safety, supervise, supervision, values.